Product prices and availability are accurate as of 2019-04-22 08:37:59 EDT and are subject to change. Any price and availability information displayed on http://www.amazon.com/ at the time of purchase will apply to the purchase of this product. A progressive, informative art course for beginner watercolorists, revealing the secrets and science behind watercolor. Many watercolor artists are disappointed with the results of their endeavors, because their attempts at painting do not always turn out as intended. However, the majority of mistakes are caused by the misuse of paint rather than artistic inability. Understanding the medium and how to use it will turn failure into success, and discovering the truth about how to use watercolors is exciting, liberating and enormously rewarding. The Watercolour Enigma is based on a practical course by artist Stephen Coates, and is designed to take the student through a process of learning rarely seen in other practical art books. 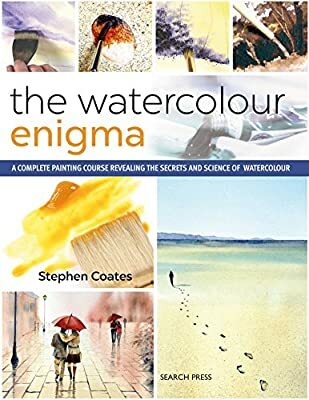 By examining the basic science of watercolour - the properties of water and color pigment, and through a series of practical, straightforward, step-by-step painting exercises, budding painters will leave Stephen's book not only with a mine of watercolor knowledge, but also will step away with a selection of stunning paintings they will be proud to have painted. 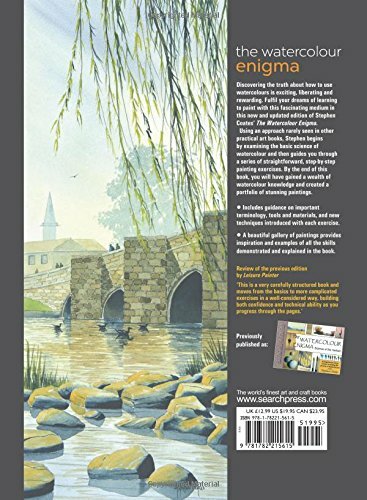 Fulfil your dream and learn to paint like a true, watercolour expert.